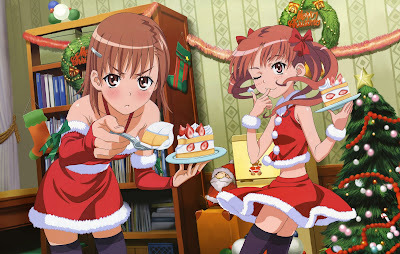 As a little Christmas present to all, here's a nice little (big) wallpaper fro the gals of A Certain Scientific Railgun! Enjoy!! Haha, I completely missed out on that anniversary post I've been doing for the past 2 years! Shame on me! Well, time to make up for it! A very well done animé, and well executed! And I can't wait for both movies to come out! Well, this animé never cleared half the things they've shown. For an suspense/action animé, it was pretty uninteresting. The animé pushed the boudaries on alot of things, but the manga outdoes EVERYTHING the animé tried: Even the rushed ending! FMA rebooted? I watched the 1st season, and I liked it. It wasn't until waaay later on, I found out that the animé COMPLETELY strayed from the manga. (Don't you hate when that happens?) Well, I know this time it should follow the manga, but I don't want to have to rewatch the parts I've already seen. I liked the 1st season, so that'll be my FMA memory. I'll admit, I watched more than half-way through the series, but something kept telling me the ending was gonna be just as unbearable as the trudging through the series. Viva instinctive guts! Dragonball in HD, cropped to fit interesting clips, and revoiced!! My opinion: if they can do that, why didn't they just re-animate it as well? Other than that, I'm not missing out at all. I've watched all 52 eps of the 1st season, and although I loved it, watching anymore wouldn't be as entertaining. One thing I've learned from the 1st season is that each episode doesn't change. ell, seemed cute enough, the whole "Guy find newly created girl, shows her what love's all about", but it was WAAAY to sugary for my tastes! Ever picked something up and wish you hadn't? That's kinda how I felt with the 1st ep here. The music is VERY good, the story is VERY good, and the characters are VERY well-liked! One question: Is this really the end? There has actually been times where watching this I'd bust out laughing. Though each ep is about 3 mins, they could've at least made a butload of episodes, like they did with Damekko Doubutsu! Of course, it's such a generic harem name! Some people can critisize how much of a generic fanservice-like show this series was, but all the same, I liked it! Sure, almost no character development, but it was a nice ride! In the end, Sayonara Zetsubou-sensei is Sayonara Zetsubou-sensei. There's now no difference between seasons. You know, at some point I've actually forgotten all about this series, just like Kono Aozora ni Yakusoku. I gotta finish those eps up, and before the New Year starts! Y'know, I really should finish this animé, because it was pretty funny! It reminded me of Azumanga Daioh meets Comic Party! Pretty educational! 1 more ep, but I can't find the time to watch it! Lol, maybe it's just the fact that, 1: There are better shows to watch, and 2: it's just not that interesting halfway through. I can probably understand why people liked this series: You LEARN from it! Almost no other animé helps you with that! But alas, not very interesting. No comment....Well, what the hell! 2 skimpy teen mermaids going o the surface for lulz? Usually it'd make for a funny scenario, but not THIS animé! Well, as soon as I started reading the manga, the animé comes out, so I think, "Eh, why the hell not?" I eat my words, and turns out this animé strays from the manga into complete fanservice.The only saving grace was Shizuku! Shizuku~! This series is by far my favorite! Each episode is HILARIOUS! And each episode progresses! Plus with a great cast of characters, this series has it all! Lol, again, I lied. Either DtB:GotM is the best of Fall 2009, or Railgun! Y'know, when I first heard they were making a 2nd season, I thought it was all fanservice, no plot. But the story is AMAZING!! Like the original writer wrote the script for this! Another fun and funny animé, it's hard to beleive this was originally a light novel with this many parodies to it! The 1st ep was great! Though it's dropped since, this series is progressing quite nicely overall. This series is pretty interesting, though I have an "Asura Cryin'" vibe to it. I'm sure it's a wonderful animé, but all the same, it's just too flowery. 1st season was just, meh. And now the 2nd season? Bleh. As soon as episode 2 was released, I found out how horrible the animé was. Not only have they strayed from the story, but the animation's AWFUL!! Again, I'm sure it's a wonderful animé, but all the same, it's just too flowery. Meh, VERY slow paced. Not so interesting after all. ...I don't even remember what this animé's about. Ooh! A sequel! I'm looking forward to how hard this series can make me laugh! WTF? It's like Kanokon, but more incesty, and it goes all the way! Lol, thanks, xwulfd, I finally figured out how to delete those, haha. As for Anon, I'm technologically declining, haha, so it'll be quite a while before I become Twitter-friendly!